I should have known that something new and different was about to emerge when I turned 60. My zany mind coupled with my necessity for change has always been a mixed blessing in my life. I suffer from the”pot of gold” syndrome – always looking for the new and exciting ways in which to invest my life here on this grand ‘ole planet. 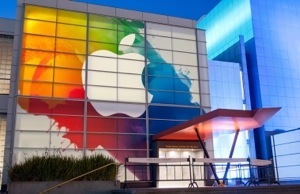 And, truth be told, who goes to Florida for three weeks of sun and relaxation with one sole purpose in mind: to stand in line in front of the Apple Store at the Mall Of Millenia, awaiting the release and acquisition of a shiny new IPad 2? That would be me – the eternal “pot of gold” lady. Mind you, the three weeks of gorgeous weather, in the company of family and friends, was truly the icing on the cake. Great memories that I will treasure forever. 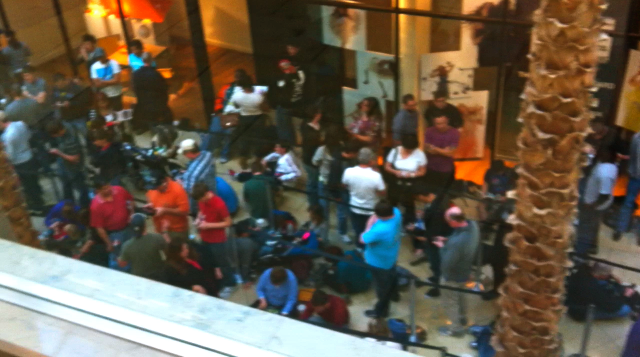 Yet, I tell ‘ya, I had so many laughs waiting in this ridiculously long IPad 2 line. I met so many people whom I will never see again but with whom I instantly bonded. 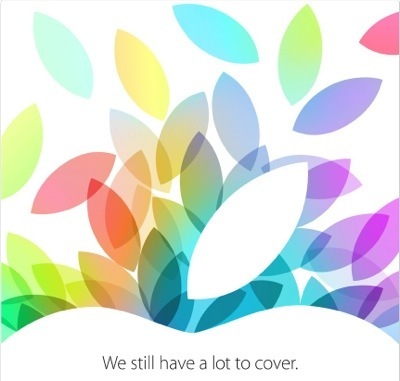 We were all there for the same reason – we wanted the IPad 2 and loved Apple Products so much. So, at 1:30 P.M., I planted myself at the back of the 2nd line (oh dear), behind a sweet young man named Zach or Zack – I never asked the spelling of his name – and his family who rallied to give us support and conversation. 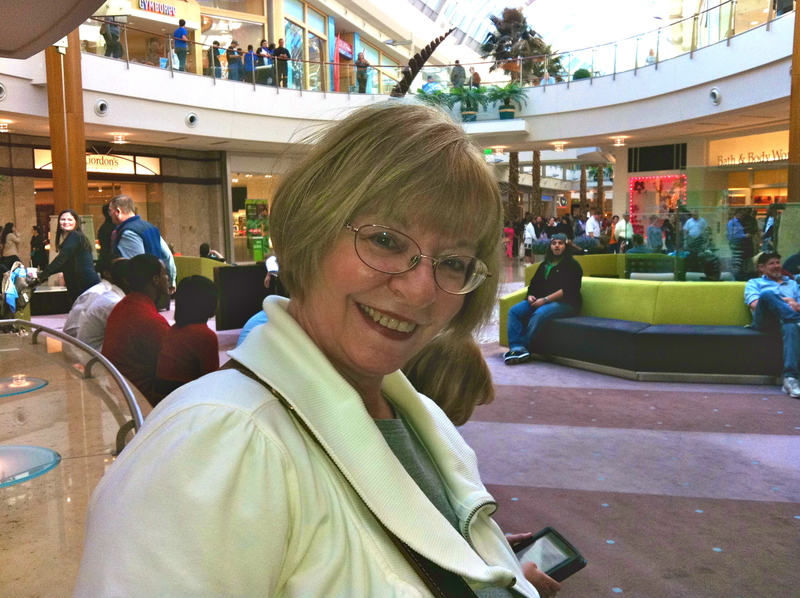 My husband took off to explore the Mall – he wanted no part of this! Although, he did return an hour or so later to give me a break. That “for better or for worse” pledge really kicked in big time. However, we were actually very lucky because there was a seating area where our section of the line was situated, so the 4.5 hours breezed by pretty quickly. And we amused ourselves taking videos and pictures of all the poor souls who had to stand up and/or lie on the floor. At one point, we became delusional with hunger and fatique, thinking, perhaps, we should temporarily offer our seats for some of those behind us who were standing for hours on end. However, in timely fashion, the Apple Team came around with food and beverages and we were lifted from our stupor – securing our well-earned seats while we nourished ourselves. 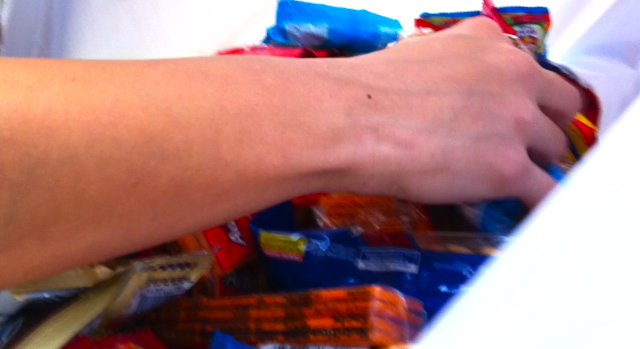 The Apple Team made absolutely certain that we were always well-hydrated and fueled, routinely walking by with a grab bag full of goodies and water. And, for the trendy geeks, the Starbucks was just above us on the upper level, so all was good. As we looked up, we noticed that throngs of people were gathering on the second level, just watching the madness. 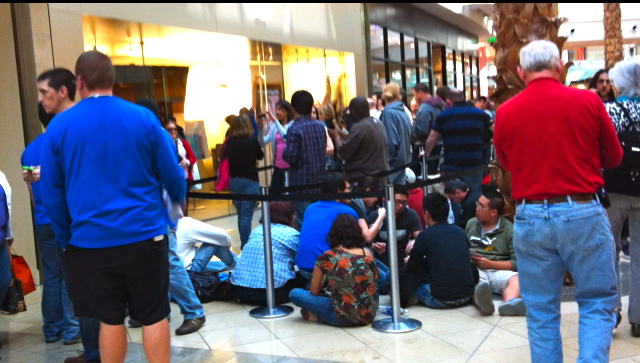 These Apple Release Days have truly become spectator events. And then, when we looked back, the line had grown and snaked its way to the end of the mall and danced a loop-dee-loo in the process. Suddenly, the long wait in line was well worth the time and effort. Call us crazy? Crazy like a Fox! Finally, the bewitching hour approached – 5:00 P.M. – and the doors opened to much fanfare. There were, perhaps 80-100 people in front of us -a good 60 -90 minute wait we figured until we were at the head of the line. 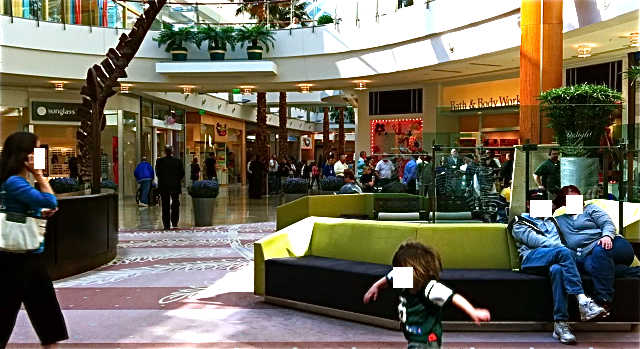 But, thankfully, we were below the Food Court and the wirelessly endowed Starbucks, so all was good. We decided to spend our time taking a survey on which model of the IPad 2 everyone was hoping to purchase. Black + 64 GIGS +3G +Wireless was the popular pick. Now, we were worried. What if they everyone ahead of us had the same goal? However, as we drew closer to the front of the line, an Apple employee came outside the main doors and said that the white, wireless 8GIG IPad was sold-out. And we breathed a collective sigh of relief as we jumped another hurdle. We were also saving places in line for those who needed a bathroom break and/or a Starbucks. At one point, an IPad 2 customer,who was situated behind me, disappeared to grab a Starbucks just as we entered the final stretch of the line-up. I guess it was “coffee time” in the mall because it appeared that he was never coming back. Lots of suspense and drama ensued. It was important after all, we are talking about a Starbucks coffee. However, he made it down the escalator just in the knick of time. Soon, I was at the front of the line and greeted and escorted by a very courteous, caffeine-enriched Apple Employee. And, before I knew it, I was the proud owner of a black IPad 2- AT&T 3G plus wireless. However, when it came time to set up my AT&T account, the AT&T program refused my credit card because it was listed under a Canadian address. Now, let me tell you that I just paid for this IPad with the same credit card, so this all seemed a little surreal to me and the Apple people. After endlessly trying to break the AT&T system, the Apple Team encouraged me to take a run over to the AT&T store situated outside the Mall At Millennia. The AT&T people were great as well, but nothing they tried worked. It was a nightmare. So back to the Apple Store I went, manoeuvred myself around the still growing line of people waiting to purchase an IPad 2 and hooked up with an Apple employee called Gary. I decided to exchange my IPad for a purely wireless model, which was a very good call because of the Personal HotSpot capability on my IPhone 4. Gary more than complied but thought the whole scenario was hilarious. I was too tired to care, but he did put a smile on my face with his enthusiastic and helpful manner. And so back to the condo I went, husband patiently in tow, to begin my 1st new adventure as Grannie The Geek – owner of a spanking new IPad 2.